Archaeology is a word and a world that can easily inspire images of hidden treasures and Indiana Jones movies. It is also a rediscovering of our histories, and most importantly, a way of ensuring that we have a record of what came before. Dublin has a wealth of archaeology, including Viking and medieval settlements and much of the city between the Royal and Grand Canals highlighted as a recorded monument – in other words of historical importance and worthy of conservation. (recorded monuments are sites, structures and features of archaeological significance which are protected by National Monuments Service). Within the walls of the Grangegorman site, there are 11 protected structures, including the boundary wall itself. It has 200 years of institutional history in the form of a psychiatric hospital and a penitentiary, originally named the Richmond Lunatic Asylum and Richmond Penitentiary respectively. They were pioneering buildings, the first of a new way of thinking for both the treatment of mental health, and for prison reform in Ireland and the UK. Grangegorman’s past however, whilst starting with promising ideals, quickly became a bleak one. But it is one that must be acknowledged. When the development plan for Grangegorman was being devised, the importance of preserving, researching and addressing the site’s archaeology was highlighted. Grangegorman’s location is interesting in archaeology terms as it is not within the Zone of Archaeological Interest (ZAI), but it is surrounded by ZAI areas to the east, south and west. (See Dublin City Development Plan Map E). The Grangegorman site is such a large area so close to many other heritage sites that it had to be considered as having archaeological potential. The North Dublin Union Workhouse neighboured the Richmond Asylum, as did a major site of trade coming into the city – the Midland Great Western Railway at Broadstone. The buried walls of the Broadstone basin were due to be uncovered as part of the Luas Cross City works. Stoneybatter, to the west of the Grangegorman site is part of the old medieval Dublin. 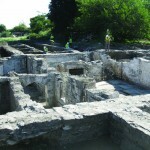 It is possible that there could be material onsite that dates back to this period. Both Broadstone and Stoneybatter are included in the ZAI, with Grangegorman sandwiched between them. One of the best examples of Georgian architecture in Dublin is on Henrietta Street, a mere 5 minute walk from the eastern edge of the Grangegorman site. 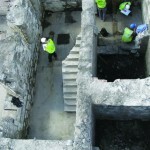 Back in 2012, as part of the Luas works, Georgian basements were excavated for the first time. It was thought that with some of Grangegorman’s development taking place during the Georgian period (generally accepted as being from 1714 to around 1830) there was a strong possibility that there would be basements to be found at Grangegorman (note however that the buildings at Grangegorman are primarily of Victorian architecture). 2. Rising Interest in Post-1700 History. As more time passes, changing attitudes towards post 1700 sites gives rise to new archaeological interest in topics such as industrial heritage. This includes buildings, machinery, infrastructure – anything used in industry – and Grangegorman, having an extensive hospital complex, contained a laundry building and farmlands, which could contain artefacts of interest. Again, with the site neighbouring the Broadstone and the old canal basin there, Grangegorman potentially could contain something of industrial heritage along the eastern boundary. The old route of one of Dublin’s rivers – the Bradogue – had been culverted at Grangegorman. The river’s original route is considered a site of potential archaeological finds, including the possibility of pre-Christian sites. (If interested in the River Bradogue let us know and we’ll try to feature it in a subsequent blog). 4. The Grangegorman Manor House. 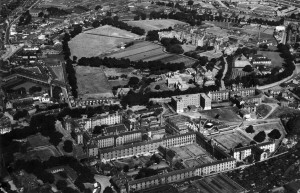 It was thought that the outline footprint of the original Manor House of Grangegorman could be found with the site’s 73 acres. Old maps of the area show the general location of the house but many of these maps were drawn to varying scales and orientations leaving archaeologists unsure of where the original Manor might be. This meant that it was open to possible discovery on the Grangegorman site. It is since widely considered that the Manor House was originally located on the site of what is now Stanhope Street School. 5. 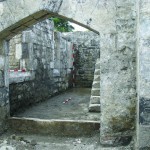 Possibility of Burial Sites. During the document review of Grangegorman, it emerged that a possible mass grave was listed onsite, which would not have been unusual for institutional land such as this. The document shows that in the 1830′s the governor of the Richmond Penitentiary consecrated a piece of land in the governor’s garden in preparation for burials. This was due to warnings of the great cholera epidemic that was spreading across Europe, eventually reaching Ireland in 1832. The mild, damp weather and overcrowded living conditions in the city meant that the highly contagious disease quickly spread and thousands died. Temporary hospitals were set up all over Dublin city, including in the Richmond Penitentiary, and victims were buried in mass graves, the main city one being at Bully’s Acre, near the Royal Hospital at Kilmainham. In addition, as the document uncovered by the archaeologists shows, another burial site was prepared at Grangegorman (another cholera hospital site) to take the overflow. This finding gave the archaeologists pause for thought. The City Archaeologist was enlisted to help establish where on the Grangegorman site this former governor’s garden may have been. On old maps a governor’s garden is marked just south of the Clock Tower, on the plot that is now being developed as the East Quad (link to project page). Extensive testing was carried out in advance of construction but nothing was found. As you can see from this brief overview, there are many reasons why our archaeologists consider the Grangegorman site of heritage interest, despite being just outside the ZAI. This is an introduction to the complexities of the site and a hint at the wide-ranging research methods carried out in the quest for answers. In a later blog the theme of archaeology will continue and look at what steps were taken to carry out the archaeology strategy at Grangegorman.